It's 3-D Wednesday with My Creative Time, and today we are sharing Christmas ornaments! 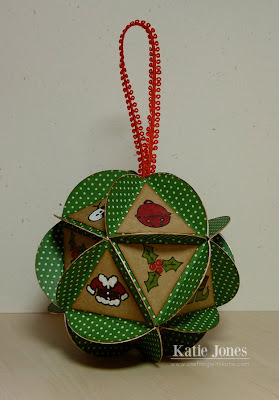 I've seen many versions of this fun paper ornament online, and I thought I would give it a try. Basically, you need to cut 20 circles (mine are 2") and score them to create an equilateral triangle within each one. I went ahead and created a circle with score marks in Silhouette Studio and cut 20 of them out of some green polka dotted paper from last year's Recollections Sugar Plums stack. I also created triangles that were slightly smaller than the ones created when I folded the circles, and I cut them out of kraft cardstock. 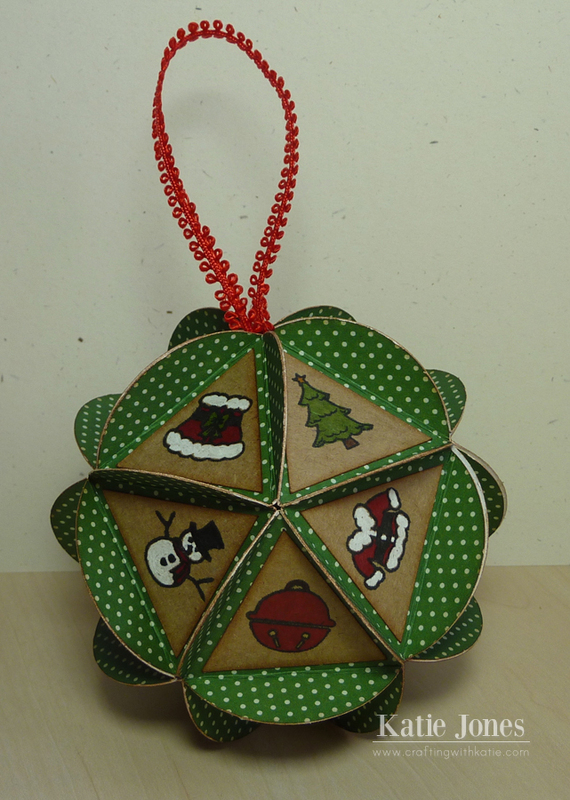 To figure out how to attach all of the circles, I followed instructions that I found on Martha Stewart's website. But, my design team buddy Kim found an awesome tutorial that really shows you how to do this without a Silhouette! In each triangle I stamped a Christmas image from My Creative Time, coloring them with Copic markers and a white gelly roll pen. Most of the images, such as the santa suit, snowman, and Christmas tree, came from the All Around Christmas stamp set. I also used the bell from It's a Magical Season and the holly from From Our Family to Yours. Before adhering the ornament completely together, I knotted some pretty red picot ribbon from Liz's Paper Loft Boutique inside of the ornament to create a hanger. Be sure to click on the link below to visit Emma's blog to see what ornaments she and the rest of the design team have to share with you today! WOW...just WOW! I love this...looks so beautiful with the green and kraft and the distressing! Beautiful job!! :) Thank you for the link!! Fantastic ornament gosh you sure have the talent to figure this one out...just everything about it is unbelievable. Girl your talent is awesome!!! awesome, love all the stamps on it!!! Katie ~ Well you know how much I LOVE this ornament! I LOVE the paper you used and what you did with ALL those MCT images!! The inking on the edges of your triangles ~ Oh wow! I ususally have smudge marks on mine!! PERFECT coloring!!! I seriously can't wait to make one of these!! Oh no need for a shout out!! I need to get that ribbon you used! This is just GORGEOUS all the way around!!! So creative. I love how it turned out. This ornament is gorgeous! 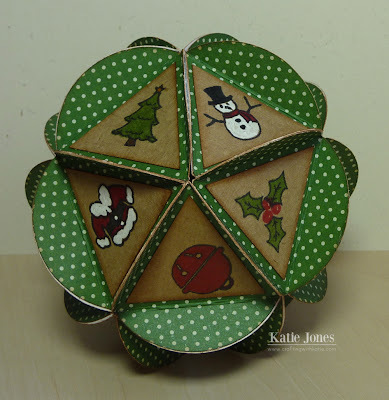 I love the polka dot paper and the little images are perfect! Great job! oh my goodness Katie, this is so FABULOUS! is there anything you can't so with that wonderful machine! Beautiful ornament! I love how you added the triangles with the stamped designs...how perfect.